Back in the twenty-first century, trouble strikes the SGC. 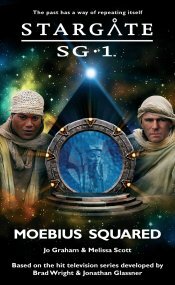 With one of their own people snatched by renegade Tok’ra, Colonel Cameron Mitchell leads the new SG-1 on a chase through time to rescue their friend – and to protect their future. But for Carter, Daniel and Teal'c, the greatest challenge is encountering themselves - and coming to terms with the consequences of their own choices. “I don’t even want to think about that thing,” Daniel said. “Or anything else to do with Janus.” He winced. “Damn right.” Daniel had only been out of the infirmary for two weeks since his latest brush with one of Janus’ inventions. This one had gotten him kidnapped and electrocuted. They all spun around as the gate began to activate.